The Northern Hemisphere in autumn 1939 came up with some statistical deviation, which may have influenced extreme cold conditions at many locations only a few weeks later. It is about rain, dry and cold in Europe and the United States , which may have contributed to this. Some observations during the first four war months are interesting and may serve as a reminder that Europe is only part of a whole system and that all the atmospheric air masses quickly and continuously circumnavigate the Earth. Depending on more or less water that is in the air circulating the Earth, the more weather conditions can vary. The question is of what impact the war in Europe in general may have had on the physical conditions of the atmosphere, and in particular what the war at sea had on the sea areas in northern Europe and thus on the air over Europe, and both together on the weather in winter 1939/1940. The circulating air masses contain a highly variable quantity of water, expressed as a percentage ratio of the instantaneous water vapor content to the maximum possible water vapor content at the same temperature and pressure. Humidity is a decisive factor for rainfall and air temperatures. Did war activities interfere with this ‘natural process’? Nuclides are required for cloud and rain formation. They are very small aerosol particles, which may consist of sand, dust, salt and smoke, and may also be called condensation nuclei, condensation aerosol or cloud condensation nuclei. Artificial "rain making" is produced by seeding clouds with substances that have an effect like aerosol particles. China has been using appropriate techniques for years, for example, to guarantee sunny weather for the 2008 Summer Olympics in Beijing (Der Spiegel, August 4, 2008). A Moscow mayor promised the Muscovites a few years ago that he would bring aircraft to seed the clouds upwind from Moscow throughout the winter in order to preserve the city from snow (www.time.com: Oct. 16, 2009). This way one can produce rain in desert regions reported the online „Arabian Business" on January 03, 2011 with the headline: ‘Abu Dhabi-backed scientists create fake rainstorms in $11 million project’; www.arabianbusiness.com. As long as the northern hemispheric jet stream smoothly circles the Earth within mid to northern latitudes, everything goes on as usual. It is a westerly wind, flowing from west to east, and it circumnavigates the Earth in a few weeks time. Its actual path influences the flow of the maritime air from the North Atlantic to Europe, the west-wind-drift, and then flow to Asia . A disruption of the usual flow occurs when the jet stream is pushed southward by a cold air mass, or the mid-latitude region is weak (too cold, or too dry). This allows high pressure to sink and create ‘colder than normal weather’ in the South. An opposite situation is possible, but that was not the case in autumn 1939. Over the first few WWII months the west-wind-drift came to a virtual standstill. The jet stream was strongly running "out of control". It came to a major interruption of the ‘general circulation’ (Scherhag, 1948), and science has no idea why. As the stability of the circulation has a lot to do with humidity, temperature and rainfall, any deviation from normal during the months shortly before WWII, or in autumn 1939 can help to identify the sources of the sudden arrival of an arctic winter. The question in this respect is, whether military activities generated rain, which lowered the ‘usual humidity’ that supported the flow of arctic air down to mid-latitude regions. This fact is obvious, but was it a ‘natural process’, or did military activities have a stake in this process? This is the matter to be discussed over the next few pages. b. Does war make rain? Is there a connection between war activities and above average rain? The question came to light during my investigation when the winter 1939/40 came up with an extreme cold January 1940 not only in Europe, but also in the United States , and in East Asia . As the naval war in Europe could hardly be directly linked to cold conditions at distant regions, the state of the atmosphere prior to January 1940 comes into play, and indeed a number of interesting observations could be made, at least in Europe and the United States . Little attention is given to East Asia as the available material was too insufficient. In any case, all this investigation can do regarding military rain forcing in 1939, is to give a brief overview, and to discuss the possible context, without offering conclusive results, as the naval war thesis does not depend on this aspect. · The Battle of Kunlun Pass, December 1939 – January 1940; Total: Troops 100,000; casualties and losses??? There was a serious flood in Northern China in July 1939; death-toll between 200,000 and 500,000. Water in the streets of Tianjin (120 km south-east of Beijing) was two meters deep, so that boats were the only means of transport for more than two months; death toll in Tianjin about 20,000. · All parts of China reported unusually harsh weather, with snow falling in some districts where it had been unfamiliar for twenty years. · Due to poverty and homelessness of millions of refugees, the civilian toll caused by the cold wave was estimated at about 65,000. · The cold wave had extended today to China ’s southernmost provinces of Kwangtung and Kwangsi. In Changsha , capital of Hunan Province , the weather was described as the worst in twenty years. A blinding snowstorm swept Lanchow ( Lanzhou ), capital of Kansu, where the cold was said to be the most severe in China . bb. Japan versus Russia: The clash in August 1939. Only ten days before WWII started, on August 20, 1939 , the Red Army with 100,000 troops went into combat with the Japanese Army comprised of 70,000 soldiers (Kwantung Army) at Nomonham, a place on the boarder between Outer Mongolia and Manchuku, in fine weather (NYT, Sept. 17, 1939). The Soviet forces had brought with them more than 400 tanks, 200 heavy guns, 400 armored cars, 500-700 airplanes and several thousand tons of ammunition, shells and bombs to the Far East , over a distance of 3,000 kilometers. Presumably not less military equipment will have been available for the Kwantung Army, which eventually was the loser in this event with 20,000 men dead, when truce was signed on September 16. __Rain had been coming down for days, and the night of September 9th, weather became very cold, wind became gusty, and snow fell hard. Some progress was seen on the bridge by the early afternoon on the 9th, but as the storm intensified, the river current increased and water rose to two and a half meters above normal. __ ‘Firing by the infantry began at 6 a.m., on September 10, followed by an artillery duel. Five hours later, rain changed to snow again, and it became intensely cold’. More interesting is an immediate great distance correlation. 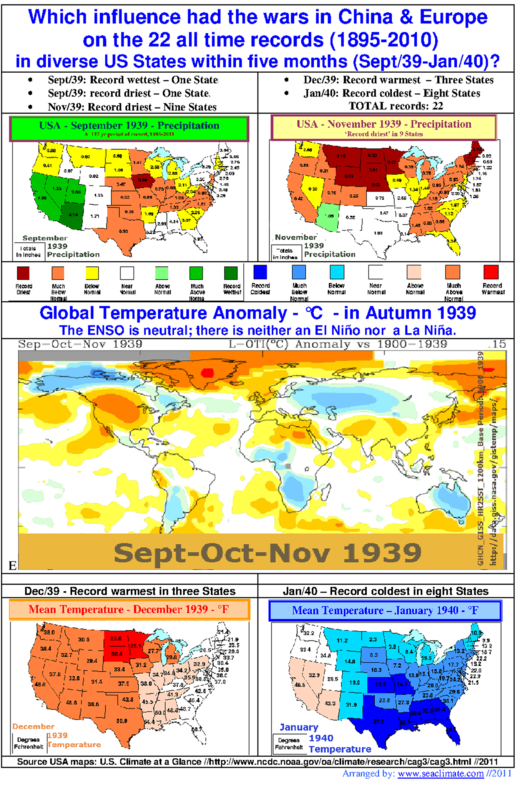 A few days after the clash had started at the border of Mongolia and China, California and Arizona were flooded by high precipitation (370% and 335% above normal during September), a few weeks later the USA was very dry, and toward the end of December a very cold winter arrived and remained with temperatures below average until the end of January 1940, as will be further explained in section C4f. 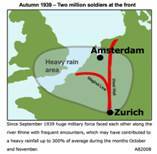 With the start of the Second World War, rainfall rose exceptionally from Wales to Austria . Many stations saw double digit numbers above the statistical averages, which increased up to 300% in October and November. The region became so much soaked with rain that in November 1939 Adolf Hitler gave up his plan (known as: "Deployment Instruction No. 1, Case Yellow") to invade the Benelux countries and France before the end of the year. Two factors could have contributed to generate the excess amount of rain. There is, on one hand, the land and air warfare, which produced large quantities of nuclides since September 1939 that could have very well been suited as condensation nuclei for the formation of raindrops. On the other hand, the naval warfare in all sea areas from the Biscay to the North Cape and the Baltic may have increased the evaporation process at sea. In autumn, these activities work like stirring the spoon in a hot coffee pot. The sea surface layer is turned over more often than usually. The warmer the surface layer, the more vapor and heat can be dissipated into the air. From September, the air above the sea surface at these latitudes is usually colder than the water. The agitation of the water by naval activities increased the evaporation rate on one hand, but on the other hand cooled down the water body more quickly. Increasing the evaporation rate means simultaneously that more air is rising and needs to be replaced by colder air. And indeed, in autumn 1939 the prevailing winds changed dramatically. Instead of coming from south-west, they came from north-east, which will be a topic in Chapter C6. 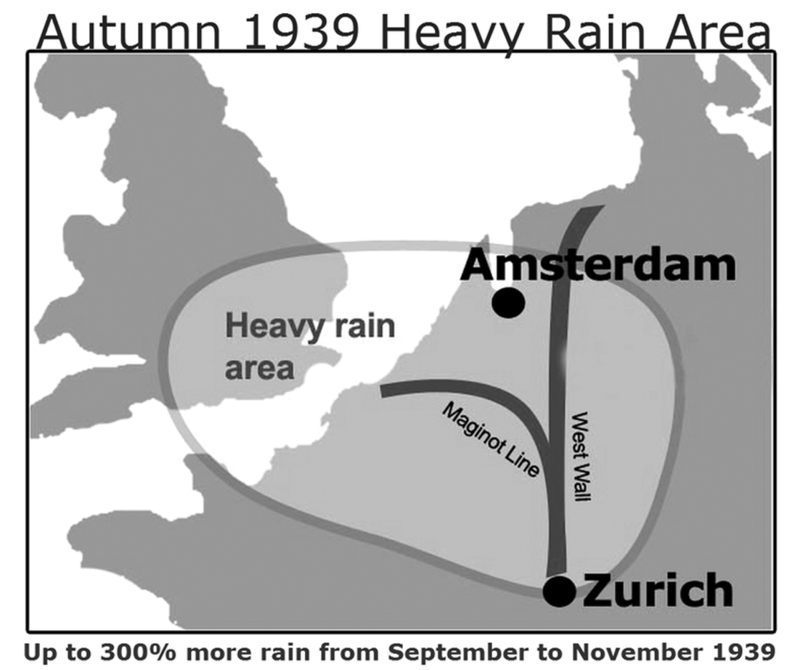 The north-easterly winds flowing in from Scandinavia, not only pushed the moist air towards the river Rhine, but due to their relatively low temperatures forced high humid air, together with the widely available condensation nuclei, to precipitate heavily from London to Basel, during the entire autumn season 1939. The process is probably also closely related to the before mentioned blocking of west-wind-drift, which I will discuss in detail in Chapter C5. Although these facts are confirmed by sufficient observational material, and science can meanwhile work with a very powerful simulator, it surprises me that so far nobody has addressed this issue - let alone even found a convincing answer. The facts presented show that the war-induced release of condensation nuclei can be favorable for the formation of rain and may have played an important role during fall of 1939. The war activities in China and Western Europe indicate a causal relationship with high amounts of rainfall, which haunted the theaters of war along the river Rhine, and in the western U.S. states. These facts have been known for 70 years, but science is still silent about it until today. If one does not want to ignore the possible reasons for the extreme winter of 1939/40, one has to look at the rain situation during the first war months discussed in the previous section. Based on data and information from Europe and the USA , this is the aim of this section. 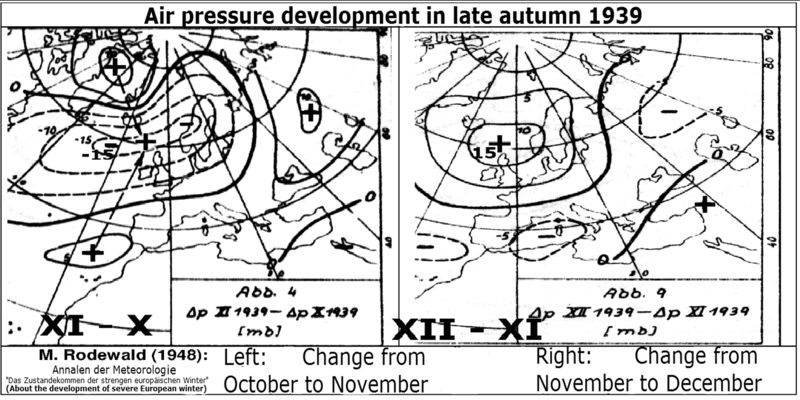 Concerning the late-autumn air pressure trends in Europe, two graphics from the work by Rodewald (1948) for October to December 1939 (Figure C4-3, next page) and Scherhag (1951) (Figure C4-5, p. 63) are reproduced. Immediately after WWII had begun, a rain zone center established itself along the war front between France and Germany , which was maintained during the months of September, October and November 1939. Each single aspect of the deviation from average matters. The closer the correlation and the more unusual the deviations from average in the weather process are, the more convincing the military actions come into play for being at least partly responsible. Each battle on land, in the air and at sea can create conditions that may cause clouds to form and rain to fall, and subsequently deprive the atmosphere of humidity, which is not quickly replaced during the autumn and winter season, due to short days and little sunshine. Less water in the air means colder but dry air. A place where this could have happened was the Western Front between France and Germany after the outbreak of WWII, where more than 2 million soldiers had been put into position along the war front in autumn 1939. Although, neither big battles nor “shoot-outs” occurred along the huge defence system along the river Rhine up to the Belgian border, everything was done to improve defence capabilities and to train and prepare two million soldiers for the worst. Therefore both fronts were busy day and night with transportation, construction, surveys, training and military encounters. The first substantial clash saw 700 French tanks and planes moving seven miles over the Saarland border, while 300 airplanes attacked German positions in the city of Aachen’s industrial region and munitions area, some 125 miles further north, (NYT, Sept. 07, 1939) encounters that occurred frequently since then over the next months. At the same time British troops were rapidly landing on the continent, while German planes were targeting England for the first time, (NYT, ditto). The Royal Air Force bombed the island of Sylt (NYT, Sept. 09, 1939) in the North Sea close to the Danish border. From now on, several encounters at numerous places along the war front and elsewhere occurred every day. They were sufficient enough to induce rain at one place and deprive it from other regions, as it happened within the first three weeks of WWII. The evident correlation is obvious when in the west of the Polish border precipitation was at a number of locations 200% higher than the average, and at the same time the rain fall east of the Polish border remained far below average. Remark: The German High Command seems to have been fully aware of the threat that the ‘Blitzkrieg’ could have been hampered by massive rainfall on Polish territory. This became clear in a meeting the German Chancellor Adolf Hitler had with the British ambassador N. Henderson on August 29th 1939 when he gave as a reason for the necessity of a speedy decision for or against a military attack on Poland that ‘his soldiers’ were already complaining that one week had been lost and that it would not be acceptable to loose another week, as any rain would favour the enemy. (Source presumably: Neville Henderson, Failure of a Mission , London 1940, p. 267 [not verified]). The scenario is quickly explained. 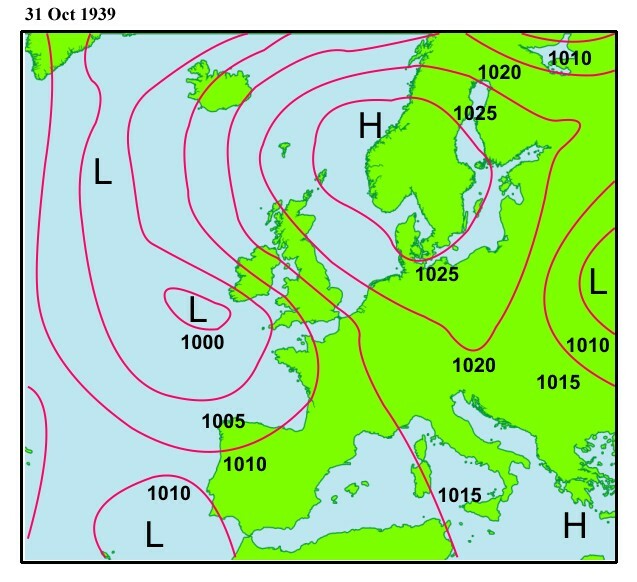 On September 4th, a wet and warm high pressure front (1015 mb), approached from the Atlantic, which brought mist and rain to entire West Germany , but quickly moved eastwards. The warm front was almost exactly in line with the French/German front at 8:00 a.m. on Sept, 4th, with the center of low pressure close to Luxembourg and rain falling in Germany , leaving nothing for Poland. Poland waited desperately for rain, to stop German advances in muddy roads and water soaked ground. In vain! The Germans got it all, the Polish got only a drizzle (NYT, Sept. 17, 1939). By then, after only three weeks at war, Warsaw was surrounded. The Red Army marched into Poland from the East. The days of the Polish Republic were numbered. 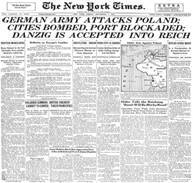 The Nazis had deployed 5,000 planes in Poland (NYT, Sept. 25, 1939). The Battle of Warsaw ended on September 28, 1939; the last Polish troops surrendered on October 6th. Within one month, the German Army, Air Force and Navy with 10,000 guns, 3,600 armored vehicles, 1,900 aircraft, dozens of warships and a force of more than 1,600,000 men had kicked up dust and ashes, which orbited the Earth during the coming weeks. 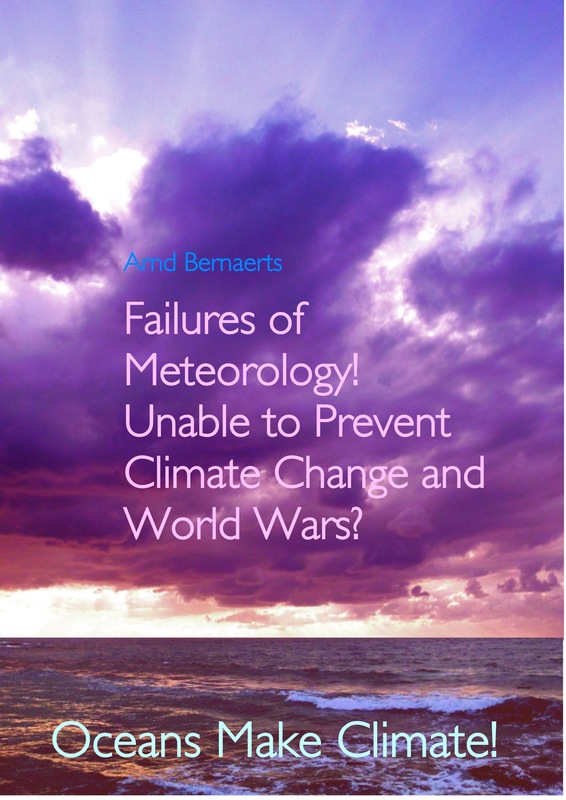 Did the war during September 1939 cause changes in the ‘natural atmospheric processes’? Presumably yes, as climatology should find out pretty soon. Here we concentrate on Europe and the USA, but take notice of a recent paper, entitled: “World War Two Bombing Raids Offer New Insight into the Effects of Aviation on Climate”, by Prof. Rob MacKenzie, at the University of Birmingham and Prof. Roger Timmis of the Environment Agency, published in the International Journal of Climatology, according to a press release on July 08, 2011 by: http://eu.wley.com. • The release of large rain-forming condensation nuclei (condensation aerosols, cloud condensation nuclei). • An increased potential of evaporation by naval warfare activities in all northern European waters from the North Cape to the Bay of Biscay . • The prevailing wind direction from northeast instead of southwest. The relationship between war activities and rain may demonstrate a reported military action in mid-October, from the New York Times under the title: "Nazi attack with 100,000 men". Regarding the weather, it said that along the entire western front bad weather prevail, with conditions even worse than they could have been for such an operation. The Germans were forced to use for the installation and replenishment transportation by rail, with the result that blocked all main routes. Rain and fog forced the Allied aircraft to remain on the ground (NYT, Oct. 18, 1939). French artillery whipped the German front line positions, roads and railroads with shrapnel in order to hamper operations. The terrain already badly pocked by artillery fire in Monday’s bitter fighting, and was covered with water holes (NYT, Oct. 18, 1939). The Black Forest and the city of Freiburg i. Br. recorded 30 days of rain; a number of other locations had up to 24 days of rain, and excessive rain in many locations, for example: Augsburg 366%; Nördlingen 362%, Kaiserslautern 336 % and Würzburg 316 %. Further west the situation was not much better. Holland reported rain throughout the month of October 1939. (NYT, Nov. 2, 1939) Southeast England recorded rainfall of more than three times above average in October 1939, and more than double of average in November (Lewis, 1940). At Greenwich the October rate of 6.16 in. (15,2 cm) had only once been exceeded in October 1880, but together with the November value (4,13 in. = 10,16 cm) amounted to the highest rainfall ever since recording began at Greenwich in 1840 (Correspondence, Greenwich, 1940). Similar conditions had been observed at Camden Square ( London ), where hours of rainfall were recorded as follows: October 77.3 h., November 96.7 h. These were 50 hours above average (Correspondence, Camden, 1940). Also throughout November 1939 war and weather continued to cooperate, as it is reflected in the news headline: “Germans continued to shell Forbach. Artillery hammered as forcefully as wet weather impeded action by infantry”, (NYT, Nov. 06, 1939). 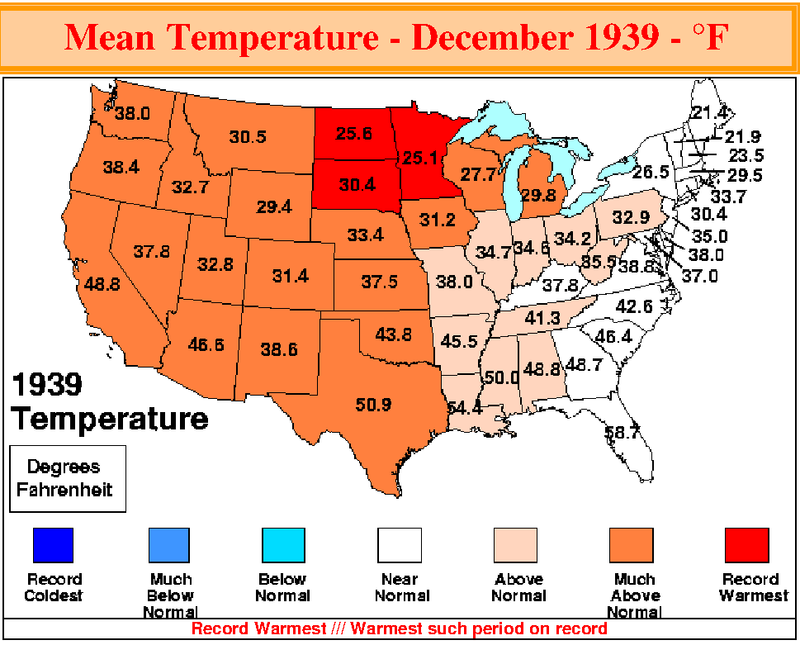 November 1939 weather conditions were not much better than in October. In general it was a bit too warm and too wet, 200% and more of normal values for the season, in Hanover , Aachen , Kassel , Frankfurt a. M., Magdeburg , Ulm , Würzburg. The river Rhine had been rising again, and there was heavy flooding in Switzerland (Neue Zürcher Zeitung, Nov. 20, 1939). Adolf Hitler’s plan „Yellow“ to attack and occupy France already in November 1939 was given up due to the too wet situation. NYT correspondent G. H. Archambault while staying with the French Army reported that: ”The autumn of 1939 was one of the wettest known” (NYT, Jan. 26, 1940). The suddenness and extreme condition of the war winter of 1939/40 had been such an extraordinary meteorological event that every aspect relating to its rapid build-up should be elaborated and weighed. The atmosphere during the particularly climatically sensitive autumn months of September to December in the Northern Hemisphere reacted immediately. Rain that came down in Western Europe as heavy downpour since the war had started on September 1st had not been available in the USA a short time later. 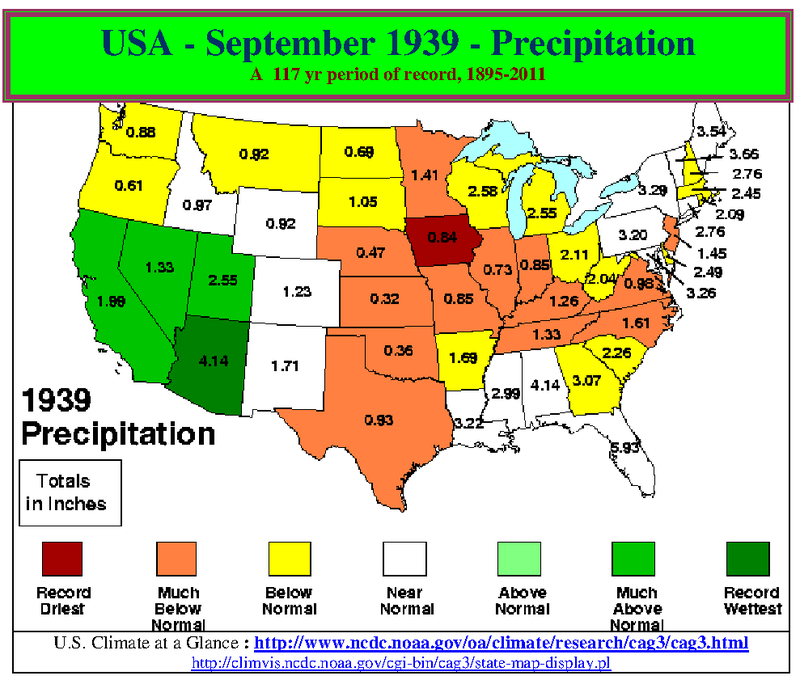 While excessive rain occurred in Europe mostly in October, four weeks later the USA experienced a record dry month with only an average of 44% precipitation for the whole country during November 1939.
d. Did the war show an effect in the U.S. in autumn 1939 and January 1940? The fact that the first signs of a real winter emerged at Christmas time 1939 (NYT, Dec. 23, 1939) was presumably not worth a doctor's thesis at any time. Neither that the winter earnestly came in early January 1940, with a frigid wave that gripped most of the United States (NYT, Jan. 6, 1940). Icy north-westerly winds swept over New York with force, on January 6, causing temperatures to drop to an average of 10 degrees Fahrenheit below normal. Frigid waves even touched northern parts of Florida (NYT, Jan. 07, 1940). But the information by Dr. James Kimball published in ‘The New York Times’ on January 7th, 1940, that November 1939 had been unusually dry, should have been investigated by science, or in a doctoral thesis, why that had happened, and whether military activities in China and Europe, and the increase of condensation nuclei had anything to do with it. The less humidity there is in the atmosphere, the more easily it can be replaced by colder air. If the amount of water in the atmosphere is less than average, the ‘vacuum’ thus created, needs to be filled by air. The fact that the Northern Hemisphere was in such a state towards the end of the year 1939 is very likely and science could have found out why long ago. The USA had been recorded as very dry in November and early December, which made it easy for Arctic air to travel south filling up the gap. But it all started two months earlier. In September 1939 the sun state had to cope with a number of weather caprioles. The unanswered question until today is what role an El Niño event had in that place at that time, and the contribution of war activities in China and Europe, due to the excessive release of condensation nuclei. Much too extraordinary and seldom was the situation that caused high precipitation during September with 370% above normal in California (Alabama, 119%; Arizona, 335%; Nevada 327%; Utah 261%); see TM5, page 59. California experienced an eight-day-long heat wave since about September 16th before a tropical storm, formerly a hurricane, hit Southern California , at San Pedro early on the 25th with winds of severe gale force. The up to 11 Beaufort strong winds were the only tropical storm to make landfall in California in the twentieth century. The air pressure went down to 971 mb, and the excessive rain caused heavy flooding, e.g. September records in Los Angeles (5.24 inches in 24 hours) and at Mount Wilson, 295mm/11.60inches). It was the heaviest September rain in Los Angeles ’ weather history and it broke the worst heat wave in Weather Bureau records, as measured by intensity and duration. (NYT, Sept. 26, 1939). The scientific disinterest in investigating whether the exceptional conditions had been a reflex action in the atmosphere that reached North America from the French-German, or the Polish-German front in Europe, e.g. from thousands of planes in the air, from shelling and burning down Polish villages and Warsaw, or even from fighting in China is stunning. 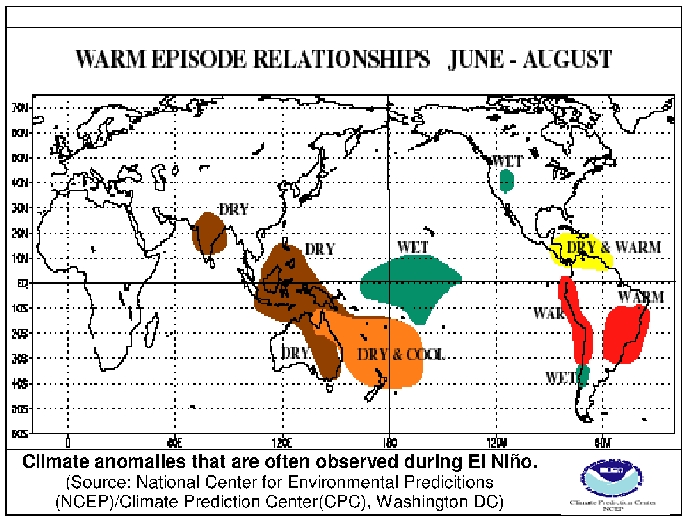 That El Niño had a stake in the issue will be hard to prove, as the air temperatures at the equatorial Pacific was neutral, if not in La Niña condition (see: TM5, p. 59), and TM7 for Sept./Oct./Nov.1939, page 93). Further details: Chapter F.
Except for a few States in the east (see above), the fall season was extremely dry over large areas. 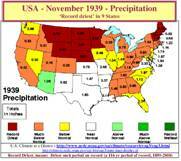 For all the areas east of the Rocky Mountains it was the driest fall on record (Martin, 1939). For about 9 States it is the all time record, TM5, and the dryness must have severely affected southern Canada as well. 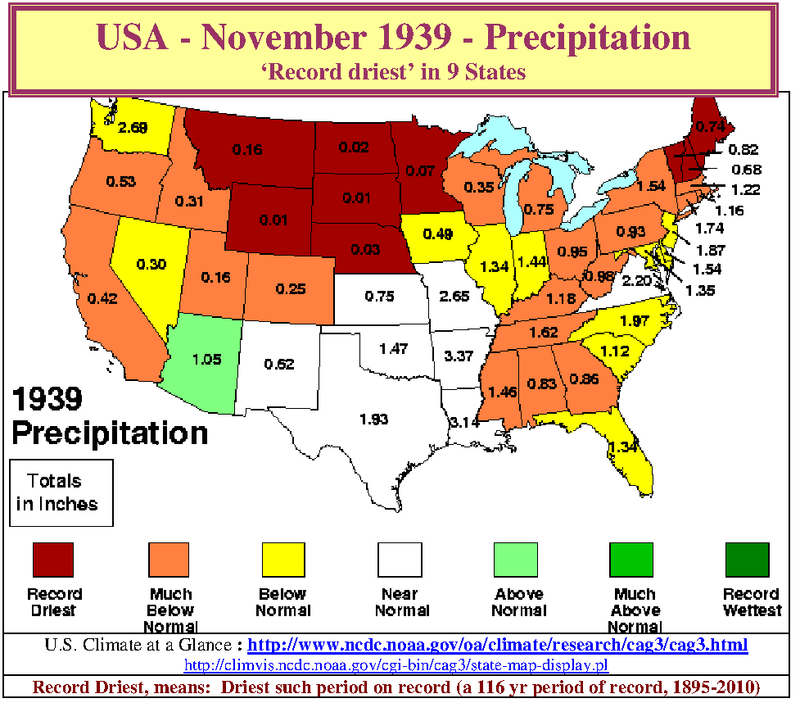 Time magazine titled on December 25th, 1939: “WEATHER: Driest Fall”, and reported "the driest fall on record, a severe case of spotted drought affecting 97,000,000 U. S. acres.” About 16 States had less than 33% of their normal November precipitation. dd. What else was curious in late 1939? After extreme amounts of precipitation in September and dryness in November (see above) December came along with another curiosity. The overall monthly temperature record was considerably above average (TM5). In three States the all time record had been observed. In the east, a change was already expected for the beginning of the holiday season: “White Christmas is likely for city” (NYT, Dec. 23, 1939). It took a few days longer for winter to come. On the 28th, it was time to report: “A biting northerly, driving grey, snow-laden clouds before it, brought to New York yesterday the coldest day of the winter. Shortly before 10 A.M. the mercury dropped to 11.9°F above zero”(11°C), (NYT, Dec. 28). Soon in 1940 the “Winds sweep the city as cold grips the U.S. ”, with “a mark of 11°F below (-24°C) in Indiana (NYT, Jan. 07, 1940. 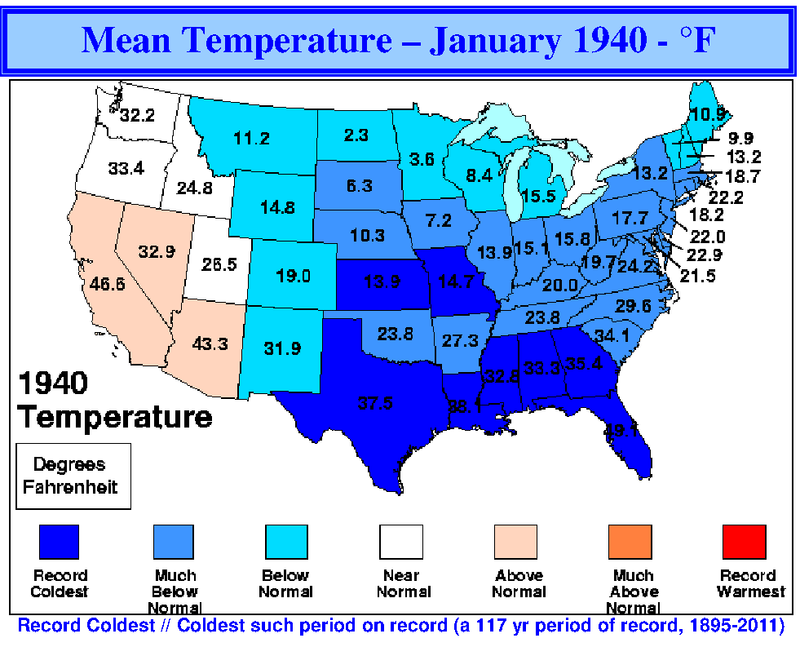 An exceptionally cold January 1940 had reached the United States , as shown in TM5 (above). 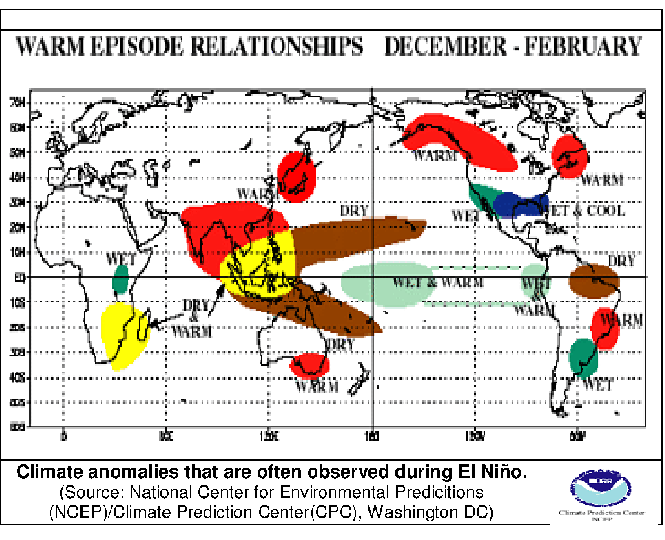 Nowadays this constellation brings the question of an interrelation with El Niño conditions into play, which is done in Chapter F.
The Timing: The ‘timing’ between excessive rain in Europe and the dry months in the United States is a perfect indication of the relationship between both events. Any ‘interchange’ between dry and wet air takes its time. A dry or humid air body can exist from up to several days to a few weeks. An ‘air body’ needs a couple of weeks to circle the Northern Hemisphere, Scherhag (1951), analysed a disruption in the circulation of air in the winter of 1940, and states with regard to air movements that there must have been a subsequent air-body-transfer ("Massentransport") from the Southern Hemisphere towards the Arctic, which means, that ‘dry air’ from Europe could have circled the globe for some time before a ‘humidity gap’ could be refilled. This also confirms that there was a ‘humidity gap’ in the first place. If the ‘dry-out’ had not been caused by military activities, what else could have caused it? 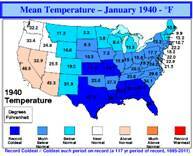 The Regions Covered: January 1940 was cold in Northern Hemisphere regions, viz. North America, Northern Europe and Northern Asia . This is a strong indication that there was too little humidity in the air (as proven in the case of the USA - above), giving arctic air a free path to penetrate deep into southern regions. f. Is it possible to establish a connection with the war? At this stage of the investigation, it is too early to give a definitive answer. Actually, this section only highlighted the aspect of rain and humidity, and gave a brief overview of the situation in the United States in autumn 1939 and January 1940. However, as long as there is not a more convincing explanation of what had caused the numerous observed deviations from the statistical mean in fall of 1939, the war in China and Europe is a serious option, and it is a more convincing work thesis rather than talking about meaningless "natural variations". Anyway, timing is perfect, and far and wide, no other identifiable cause can be seen, at least not for the conditions in Europe . A number of indications show that the war in Europe and in China may have significantly influenced winter weather conditions over long distances. In this case, North America had a severely cold January in 1940. Most likely, it had been supported by a lack of usual rain in the United States during the months of October to December 1939, in the first place due to generating condensation nuclei by military activities in Asia, in Poland and along the Western Front in Europe . 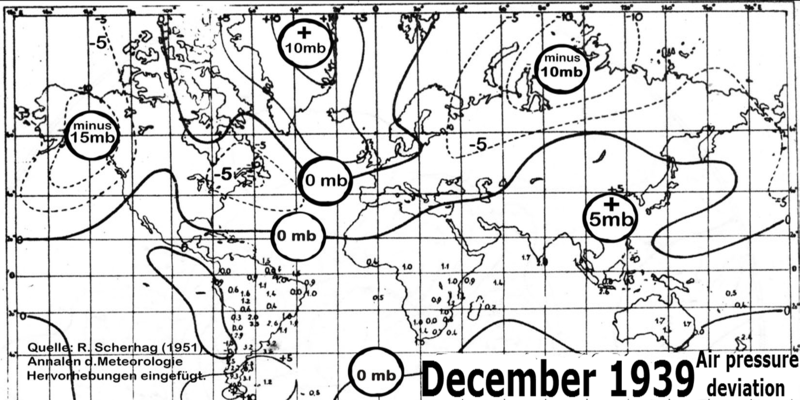 The obvious “rain forcing” in autumn 1939 that caused low humidity in the atmosphere, made it easy for arctic air to forcefully travel down to the mid-latitudes of the Northern Hemisphere. The timing of ‘dry air’ and the invasion of polar air over all NH continents suggest that this was not a mere natural variation. The drier the air properties at lower latitudes are, the easier arctic air can spread southwards. The lower maritime influence is (warm moist air), the more continental conditions will prevail (cold dry air). The Northern Hemisphere felt it with full force in January 1940. A severe winter, the coldest in one hundred years in countries bordering the most war-affected seas in Northern Europe, did not come ‘just out of the blue’, but it was a combination of too dry air circling the hemisphere and naval operations in the marine environment of Europe. The September 1939 precipitation (deviation from average 1851-1930) for some places in Germany had been as follows: Berlin-Dahlem (197%); Frankfurt/Oder (197%); Breslau (204%); Ratibor (210%); Karlsruhe i.B. (208%); Stuttgart (199%); Ulm (226%); Würzburg (215%); München (212%). Source: Witterungsberichte, 1948.